If your idea of hostels involves dubious neighourhoods and grungy bathrooms, then welcome to the new line of hostels in Croatia which has redefined budget accommodation. Particularly in Zagreb, the nation's capital, dynamic young designers have brought real panache to the task of glamming up the hostel experience. Wifi, air-conditioning and gleaming facilities are now the new normal. Bright colors liven up the walls and bedding and often bunk beds come with curtains for greater privacy. There are two kinds of hostels in Croatia: "official" youth hostels operated by the Croatian Youth Hostel Association (HFHS) and "private" hostels run as a business. 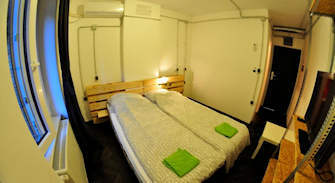 Hostels are an excellent alternative for solo travellers because you avoid the "single supplement" imposed in all hotels and much private accommodation. Also, it's so easy to meet a travelling companion in a hostel. Couples and small groups however, will nearly always do better renting a room or apartment, unless of course you're looking for the kind of ambience only a convivial youth hostel can provide. Prices are from €15.50 for a dorm bed including breakfast and a bit more for those hostels that offer singles and doubles. Notice that if you do not have a valid Hostelling International card you pay about €1.35 for a welcome stamp. After collecting six welcome stamps--presto!-you have a HI card. Need I mention that you should reserve well in advance for a hostel along the coast in July & August? There are also some excellent private hostels scattered throughout Croatia that are clean, safe and well run. Usually breakfast and linen can be arranged and some have a few double rooms on offer. Half-board can also be arranged but bear in mind that you can eat fairly cheaply and well in most parts of Croatia. See my recommendations for hostels and private accommodation in Dubrovnik, Hvar, Pula, Split, Zadar and Zagreb.